The best New York facials all year round.Facial Spa in Manhattan NYC. Facial Spa in Manhattan NYC. New York Facials. The best New York facials are available year round, and for the greatest results, which facial you choose should depend upon the season. Dyanna Spa in Manhattan NY, has some great recommendations to help you make your choice. Here are just a few ideas from the experts at Dyanna’s day spa. With all the heat, humidity, and grime that come with living in New York City during the hottest months, summertime is a much-needed time for a facial. Here are a few ideas from the experts at Dyanna’s day spa. Peeling Facial uses vegetable and fruit enzymes for a thorough exfoliation. It rejuvenates the skin, giving it a more youthful glow. A 60-minute treatment costs $65.00. Hydra Medic Acne Facial by Repechage is a deep-pore cleansing treatment that uses a special “Desincrustation Mask”, which smoothes the skin and heals lesions. A 60-minute treatment costs $95.00. Deep Pore Cleansing Facial is excellent for people with acne and large pores, and is actually great for each of the seasons. 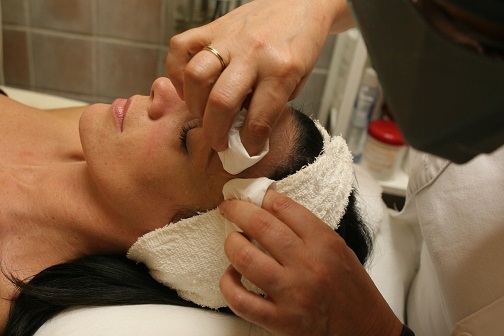 Our esthetician extracts all blackheads and whiteheads and then applies a moisturizing mask. A 60-minute treatment costs $85.00. Hydra 4 Sensitive Skin Facial uses olive oil, olive leaf extracts and seaweed to nourish and moisturize sensitive skin. A 60-minute treatment costs $85.00. The fall season is a good time for a facial to help repair some of the damage done to your skin during the summer. European Deep Pore Facial cleanses, exfoliates, and moisturizes the skin. A 60-minute treatment costs $75.00. Black Currant Facial uses a black currant seed oil mask that nourishes, protects, and calms the skin. A 60-minute treatment costs $85.00. Vita Cura Firming Facial is perfect for lifting, firming, and adding elasticity to mature skin. A 60-minute treatment costs $95.00. With winter comes dry air and with dry air comes dry skin. A winter facial is important to hydrate and soothe the skin. 24 KT gold facial improves blood circulation and is rich in minerals and antioxidants to rejuvenate your face. A 60-minute treatment costs $85.00. Caviar Facial is rich in needed Omega 3 and Omega 6 fatty acids that are partially responsible for the reproduction of new skin cells and the repair of damaged skin. A 60-minute treatment costs $85.00. Glycolic Anti-Aging Facial Treatment’s active ingredient is alpha hydroxy, which minimizes fine lines and wrinkles, softening and smoothing out your skin. A 30-minute treatment costs $45.00. After the drying effects of winter, spring is a fabulous time to spruce up your skin. Sheep Placenta Facial contains many important nutrients and minerals for your skin and helps with almost any kind of skin problem. It nourishes and moisturizes. A 60-minute treatment costs $85.00. Collagen Eye Treatment reduces those fine lines and wrinkles around the eyes, helping reduce the signs of aging. A single treatment costs only $15.00. Aromatherapy Facial is perfect for reducing the effects of stress on our skin. With a gentle massage using aromatic oils, circulation is improved and tension relieved. A 60-minute treatment costs $75.00. Dyanna Spa has many other types of facials and body treatments that will have you looking and feeling your best. Contact us now to schedule an appointment for one of our affordable NYC facials in Manhattan. With the dry heat of summer gone, and the dry air of winter on its way, now is the time for anti-aging treatments from Dyanna Spa in Manhattan, New York. Our anti-aging treatments will reverse sun-damaged skin from all those days at the beach, lessen those fine lines and wrinkles, and hydrate dry skin so you will look younger again. The Four Layer Treatment is a piece of cake. One of the best anti-ageing treatments we offer, this 45-minute procedure will firm up the contours of your face, eliminate fine wrinkles, and re-hydrate your skin. Derived from seaweed, minerals, and amino acids, this skin care treatment will leave you feeling refreshed and looking radiant. If you’re wondering how to look younger, the 45-minute Placenta Recovery Essence Treatment is the way to go. Scientific studies have shown plant and sheep placenta to be rich in proteins, iron, enzymes, and other vital nutrients. Not only will it nourish your skin, and smooth out your wrinkles, it also helps postpone the skin aging process. The anti-aging properties of our Caviar B Toxin Nano Crystal Treatment help eliminate wrinkles, improve the skin’s elasticity, and relieve signs of fatigue. Caviar is rich in Omega 3 and Omega 6 fatty acids that control essential hormones vital to the reproduction of fresh skin cells and the repair of damaged skin. Caviar is very high in skin-repair vitamins A and E, and in potassium and selenium, which improve the elasticity of your facial skin. After this 45-minute facial treatment, you will radiate health and youthfulness. The Ultra Elastic Collagen Protein Treatment, high in collagen nutrients, will improve the skin’s elasticity and hydration. It enhances the skin’s cell renewal process, and promotes smoother and healthier skin. This 45-minute anti-aging therapy is the perfect solution for men or women looking to reduce visible signs of aging. The Red Wine and Pomegranate Anti-Oxidant Treatment contains some of nature’s best anti-oxidants and healing properties for the skin. This anti-aging treatment incorporates a complex formula based on hydro-gel technology to help detoxify and de-stress the skin. The procedure takes years off your face in just forty-five minutes. Our Glycolic Anti-Aging Treatment contains Alpha Hydroxy Acid, which minimizes fine lines and wrinkles. It also treats dry, rough skin and age spots for healthier and younger looking skin. It’s very effective in helping the body produce new and undamaged cells and can assist healing acne prone skin or post acne scaring. After this 30-minute anti-aging treatment, you’ll leave feeling rejuvenated and youthful. Don’t let dry skin or those fie lines and wrinkles win. Now’s the time to fight back! Give us a call at 212-995-2355 to schedule an appointment. You should also check out our other anti-aging treatments for both men and women on our website. You may even want to upgrade to one of our many facials to accompany your anti-aging treatment. New York Bachelorette Parties at Dyanna Spa- The Perfect Treat! New York’s top spa team in Manhattan has some bridesmaid advice for you if you’re looking for a truly special bachelorette party your BFF will remember forever! We know that 2011 is a big year for brides – Kate Middleton, Nicole Richie, and Jessica Simpson to name a few. So if your bestie is also on the star studde d list of women planning to say “I do” this year, then most likely, being the devoted friend that you are, you’ve been thinking about how to throw the perfect bachelorette party for a while now. Well, wonder no further because we have just the answer. It is hard to imagine anything better than spending a relaxing day at a luxury spa, being pampered and beautified, with your closest girl friends by your side. But we know what you’re thinking, generic, right? Wrong! Because here are some awesome ways to spice up a “done” idea, and turn it into a “never-before-seen” event! 1) Before you begin your New York spa day, ask one of the gals coming pick up a whole box full of fun assorted pastries – because little else makes a woman happier than her fave comfort food. If you can, organize to have all party attendees travel together, and break out the goodies on your way to the spa to set the mood. Alternatively, if space and time permits, invite the bride and her friends over for pre-spa day breakfast at yours. Bagels, spreads, and Spanish Omelets included – YUM! 2) When you call to book the spa appointments, ask about whether your spa will allow you to use the waiting room for a while where party guests can sip tea and chat together either before the treatments begin, or after everyone is done. During this time, you can play a game revolving around the bride-to-be, making her feel extra-special! One game idea is to have everyone bring a couple of beads that remind them of the bride – they could be colorful, to signify her bubbly personality, or heart-shaped, because of how much she loves to love others – and one by one, each guest should explain the significance of the beads they chose. Then, string them all up, and present the girl of the hour with a beautiful keychain that will forever remind her of her closest friends. 3) A sweet end note to a day of rest of relaxation, is to all go back to one of the girl’s homes, and put on a video of the bride’s all time favorite chick-flick. Just before she commits herself to her true love, remind her of the Hollywood life she hopes to live – and tell her she can have it all and more if she tries hard enough! One last, quick technical tip: To make sure that things go as planned, sort out the payments for the day beforehand. One easy way to make sure that the spa treatments get paid for without confusion, is by pre-ordering a spa gift certificate that will cover the entire cost, and having all party members split the gift certificate ahead of time. That is, all party members except for one!. Good luck, and enjoy yourselves ladies! No one knows how to care for skin better, than someone that spends 80% of their life in a spa! That’s why the trusted beauty and women’s interest site, SheKnows.com, came to New York City/ Manhattan’s Best Spa owner, our very own Irina Gordon, for advice on what the 3 biggest skincare essentials! 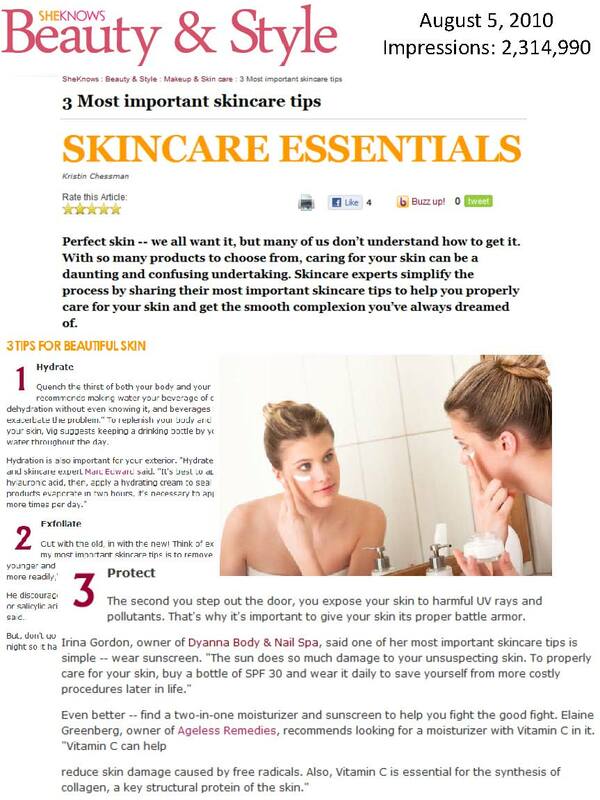 Check out this feature of NYC’s Dyanna Spa skin care tips from co-owner Irina Gordon featured in Sheknows.com! See the full story here: Sheknows.com. 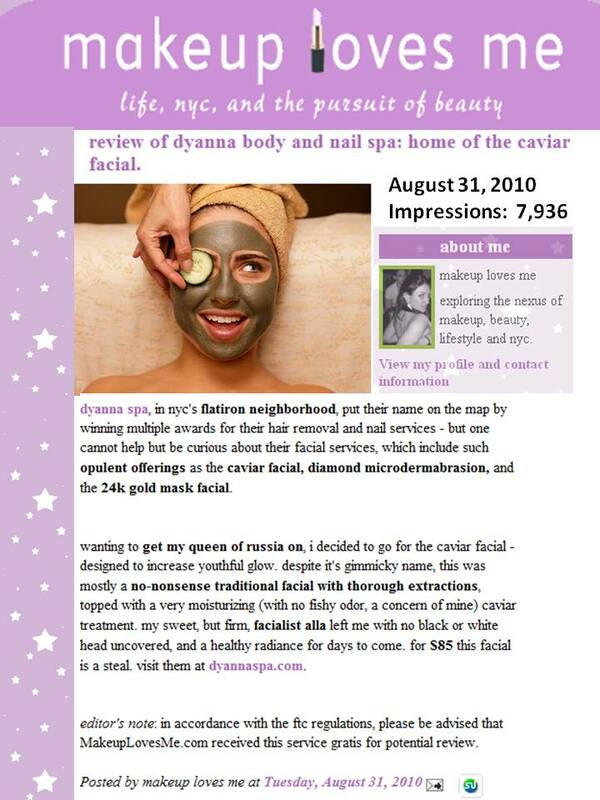 Have you seen Dyanna Spa‘s Caviar facial featured in the popular blog, MakeUpLovesMe.com ?? If you haven’t, check out the article here: MakeUpLovesMe.com!